Back to the beginning and to follow on from my last post now it is time to talk birthdays and the reason for our most recent trip to Phuket! Major birthdays always have an impact on our lives, both positive and negative and in my community the older you get the more we should be celebrating the growth and life experiences but we sometimes denigrate age as a bad thing. 30 however is still young enough to be considered prime time in the gay community and so it was that we descended on Phuket for a week long celebration for Zac’s 30th birthday. 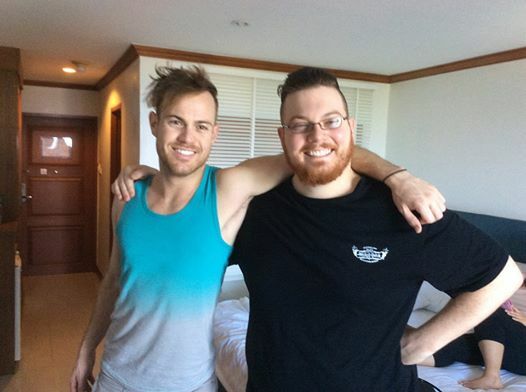 As he is now located in LA he made the suggestion that we meet in a location that involved travel but was not as long a trip as heading to LA and of course it meant that more of the family could attend as the price was not so high either for us to fly from Perth to Phuket. Great idea and what it meant was that there was 14 of us who took the journey to help Zac turn from a twenty something to a guy in his 30’s and what a great week we had. If you saw my previous post you will see a review of the wonderful Novotel Resort and Spa at Karon Beach that we stayed at. Phuket has evolved since our last visit and locating ourselves outside the full on Patong area made for a much more relaxed and laid back trip than our previous time there a few years ago. This made for an experience that allowed us to re look at Phuket as a destination that we would go back to again. The infrastructure has gotten better and the restaurants serving traditional Thai food have flourished and grown and continue to offer great value and some of the freshest seafood around. Having a special birthday celebration in such a location was really perfect and Zac picked a great restaurant for us all to gather at and enjoy an evening of fun, frivolity and connecting together. 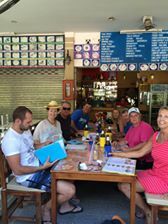 The Savoey Restaurant has two sides – one on the beach and one over the road and he booked a table on the beach side and so 15 of us gathered to laugh, reminisce, meet new people and have a great night together. For Trevor and I it was a chance to meet members of Zac’s family that we had not previously had the chance to meet properly and it was such a pleasure to meet them and to spend time at such a great location. Zac made a wonderful heartfelt speech about his relationships with his Mum and his Dad and it was emotional and a perfect reflection of his thoughts and feelings about the important role that they have played in his life and the journey that he has been on so far in his life. This was a wonderful night and I must mention some of the other guests who made a strong impression on me on the night especially Uncle Trenny who at first glance comes across as your typical aussie bloke but scratch the surface and you will see a man with a real compassion and connection to all the people around him. He is rough, tough, in your face but underneath all of that is great fun and I enjoyed all the times that we spent with him. It was also great to see and spend some time with Zac’s brother Josh and his girlfriend Blessie who are both wonderful, warm, caring people and just to see them both some into each other was a real joy! And then there was Dayle, Zac’s Mum has always been a rock for him and is the most wonderful, caring, thoughtful, beautiful and considerate woman. She has been a great supporter of all the choices that Zac has made in his life and been behind all of the things he has chosen to do. When thinking about Zac turning 30 I immediately thought back to when Trevor and I first met him. He was 14 and he was our daughter Jess’ boyfriend but as soon we met him at one of the school orchestra concerts we had a feeling that he was maybe gay. Not that we wanted to assume anything but sure enough 12 months later he came out and we were lucky enough to be able to support him at this time to go through a process that is never an easy one. 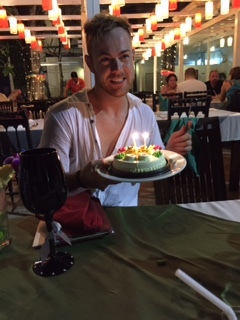 So started a 16 year involvement in his life and we were both so very proud and privileged to be part of his birthday celebrations with his family in Phuket. 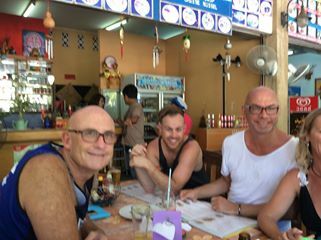 A family lunch at Kata Beach! This was the perfect setting to celebrate a 30th and after dinner the night did not stop there for us. 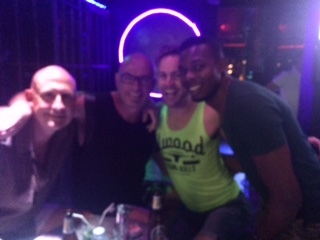 The rest of the family headed off but we took the birthday boy down to Paradise road where all the gay bars are located for some drinks and to see one of the local drag shows. It was like stepping back in time to those days of really good drag shows with great costumes, great wigs and make up and good production numbers. 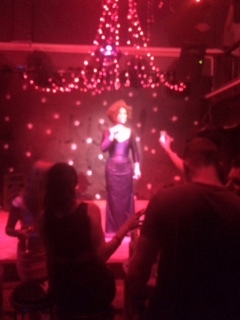 And the numbers continued to come for over half an hour…and for Thai drag the lip syncing was pretty good and the boy dancers were fabulous taking their lead from internet sensation Yanis Marshall who dances in high heels around France and choreographs some amazing dance numbers. A late night in Phuket! This added yet another dimension to the shows and was a great addition. And then it was close to 1 am and time for us to head back to the Novotel for some well earned rest and to be ready for other Phuket highlights like the Phuket town markets and a trip to Kata beach for a great little restaurant that served some fantastic seafood at ridiculous prices. These were great family trips and a chance to get to know Uncle Trenny, Kerry, cousin Scott and the rest of the crew a little better and to enjoy everyone’s company. I especially loved the trivial pursuit questions in the mini bus on the way back from the Phuket markets. 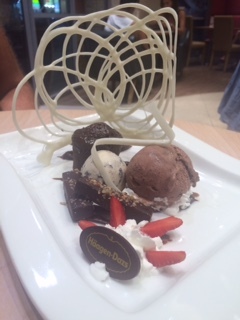 Now I cannot talk about Phuket without mentioning the fabulous ice cream creations that we stumbled across at Haagen-Dazs that were truly delicious, delightful and hit the spot after a full day of walking, swimming and relaxing. 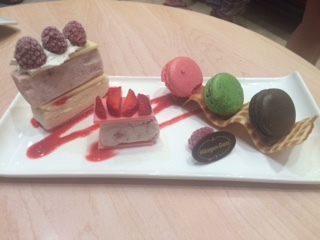 They were works of art and a local indulgence, we were on holiday after all. Stay tuned in the coming days for more from this trip with particular attention to fashion and food!